A simple crochet granny square, I remember when I was a little girl making bag fulls of these lol and my Mother saying just what are you going to do with all these squares Heather? I used to put them together to make blankets, but now they can be used for practically anything i.e tote bags, covers, kitchen items, hot pads etc. If you are just starting to learn to crochet, this pattern is an ideal one to begin with. 2nd Row – sl st across to first ch2 space, ch3, (2dc, ch2, 3dc) in same space, * ch1, skip 3dc, (3dc, ch2, 3dc) in next ch2 space * rpt from * to * to end, ch1, skip 3dc, sl st to top of ch3 on beginning of row. Fasten off. 3rd Row – Join color 2 to any ch2 space, ch3, (2dc, ch2, 3dc) in same space, * ch1, skip 3dc, 3dc in next ch1 space, ch1, (3dc, ch2, 3dc) in next ch2 space * rpt from * to * to last ch1 space, ch1, skip 3dc, 3dc in ch1 space, ch1, skip 3dc, sl st to top of ch3 on beginning of row. 4th Row – sl st across to the first ch2 space, ch3, (2dc, ch2, 3dc) in same space, * ch1, skip 3dc, 3dc in next ch1 space, ch1, skip 3dc, 3dc in next ch1 space, ch1, (3dc, ch2, 3dc) in next ch2 space * rpt from * to * to last 2 ch1 spaces, ch1, skip 3dc, 3dc in next ch1 space, ch1, skip 3dc, 3dc in next ch1 space, ch1, sl st to top of ch3 on beginning of row. Fasten off. Turn. 5th Row – Join in color 1, (WS) ch1, 1sc in base of ch1, 1sc in each ch1 space and dc around all four sides of square, working (1sc, ch2, 1sc) in each ch2 space, sl st to first sc on beginning of row. Fasten off. Finishing – Weave in and trim off any loose ends of yarn, crochet several squares and make throws, baby items or pram covers etc. Have hours of fun with these crochet granny squares. Speak to you soon with a new free crochet pattern. 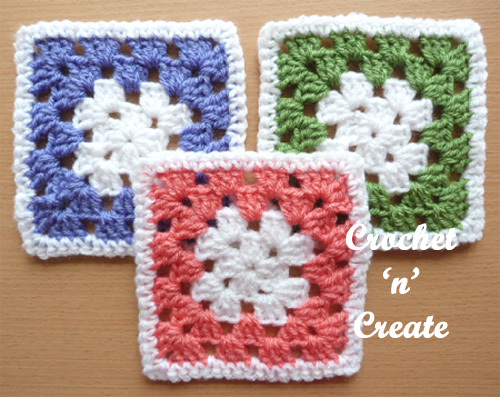 You are welcome to sell the finished products made from this crochet granny square crochet pattern, I just ask that you put a link back to crochet ‘n’ create. 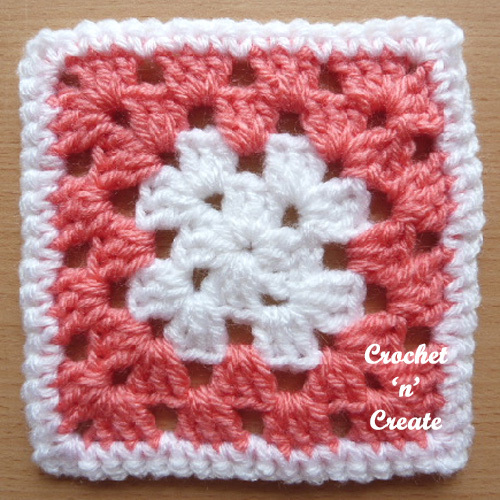 If you wish to share this crochet granny square pattern on your social media or your blog please only use a direct link to the pattern page on crochet ‘n’ create. This entry was posted in free crochet patterns, Miscellaneous Crochet and tagged crochet, crochet for home, crochet granny square, free crochet patterns on 2nd May 2017 by crochetncreate.